2 FRC Robots to play the 2014 FRC game in 72 hours?! The entire process documented online and streamed live to the world?! It’s VEXpro Build Blitz! Longtime FRC mentors and engineers Paul Copioli and John V-Neun will each be leading their own dream teams of FRC mentors and students when they compress the 6-week FRC Build Season into 72 hours. 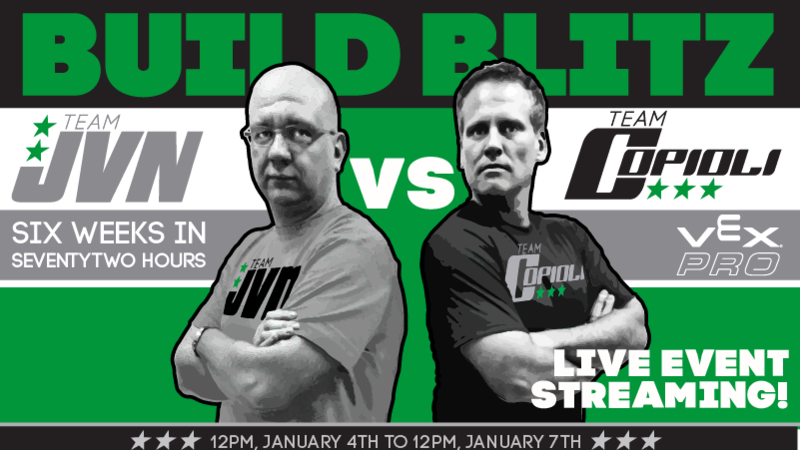 The teams will watch FRC Kickoff and then commence the Build Blitz at 12p Central on Saturday January 4th. Follow all of the action live here with live video streams, commentary, blog updates and more.